A new initiative is being launched today which aims to help control the invasive ‘lionfish’ species by encouraging local people to catch and serve it to tourists. This will conserve native reef fish stocks around Saint Lucia and support local fishing communities. Lionfish being served in a restaurant. The rapid and devastating invasion of the lionfish in the Caribbean Sea is threatening the survival of coral reef systems, reducing native fish numbers by up to 80%. In Saint Lucia, lionfish populations are increasing, but consumption is low. This is partly due to the misconception that the fish is poisonous and can’t be eaten (although the spines are venomous, with correct handling they can be easily and safely removed). Research indicates that one of the best ways to control this species is to increase its consumption, and in Saint Lucia there is a lot of potential for increasing demand, particularly among international visitors. “As beautiful as they may seem, Lionfish are responsible for reducing native fish numbers in Saint Lucia, which is devastating for both the reef and the local fishing industry. This project aims to rectify this imbalance, reducing the number of Lionfish whilst providing a new market to increase the income for local fishers” said Salli Felton, CEO of the Travel Foundation. The Travel Foundation will work with fishing co-operatives, wholesalers, hotels and tourist restaurants to build supply-chain links, demonstrating the economic value of catching and serving lionfish. The fishing community will receive training on the safe handling and processing of lionfish – including the supply of puncture-proof fish handling gloves and better traps. 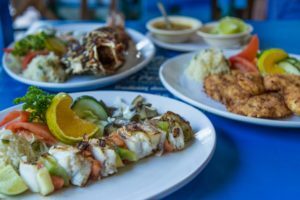 The Travel Foundation will also make hotels and restaurants aware of the benefits of purchasing lionfish, and how to communicate these to customers. It is hoped the project will help protect the coral reef – one of Saint Lucia’s key tourism assets – and allow native fish populations to recover, as well as improving livelihoods for local fishers.